In a chord, there are two main chord inversions. Chord Inversions change the order of the tones in the chord. Instead of the 1,3, and 5 tones of the triad in which the root note is at the bottom of the chord, we have the root note moved to a different position. The C major chord has C as the root, E as the 3rd, and G as the 5th. In a chord, the 3rd note can become the bottom note. The 1st inversion of this chord places E as the bottom note, with G the next note, and the root is at the top of the chord. The order of the chord is 3, 5, and 1. The C chord becomes E, G, and C.
A 2nd inversion puts the 5th note as the bottom note. The 2nd inversion of this chord places G at the bottom note, with C in the middle, and E at the top of the chord. The order of the chord is 5, 1, and 3. The C chord becomes G, C, and E.
You can call the 1st inversion the top inversion because the root is at the top. 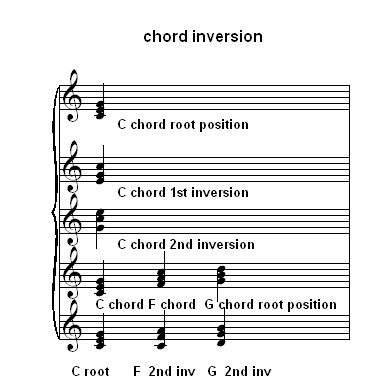 You can call the 2nd inversion the middle inversion because the root is in the middle of the chord. Inversions let you play different chords without moving your hands as far up and down the keyboard. Then you can play the 1, 4, and 5 chord progression. fingers and letting the thumb stay on C.
Then you can go from IV to V by going up the keyboard and the thumb and fingers only go up one note. There you have it. Now you can play a I, IV, V progression. Then you can play any song in the key of C major with the 1, 4, and 5 chords of C , F, and G on the keyboard.